The Lakewood house at 108 Beech Circle has sold. It sold for $175,000 and closed on Friday. There are a few houses left for sale at Dyersburg's lakewood subdivision but only one right now that I really love. 69 Oak Ridge is a 4 bedroom, 3 full & 2 half bath brick 2 story with a basement that includes parking for 2 cars. The lot size is one acre and it sits on lakewood's second largest lake. This house is listed for $265,000.The heated and cooled sq footage is 3503' and this home was built in 1992. The central units were replaced as was the roof. The windows have also been replaced and kitchen modernized with new corian tops and stainless steel appliances. I am also impressed with the landscaping in the back yard and the waterfall/stream that flows from behind the house into the lake beside the nice dock that is part of the property. Barbara has it listed and I told her I was going to sell this house. I absolutely love it. The owner has purchased another house so should be motivated for a quick sell. 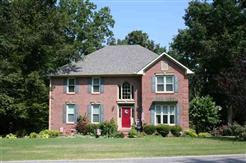 If you are looking for a beautiful brick home in Lakewood on the water then this is it! Call or text Mike at 731-589-7841 to view this lakewood beauty!